Sometimes it’s handy to print out your calendar info. I know, I know—printing out something that’s available on all of your devices, all the time? Craziness. But it’s useful to know how anyway. And the Calendar program has a bunch of ways you can print stuff, including creating your own blank calendar sheets, which I’ve written about before. But you can also print just a few selected events if you need to, so if you want to give someone, say, your itinerary for a weekend without having to share a calendar with him, you can. Here’s what you’ll do to accomplish that! 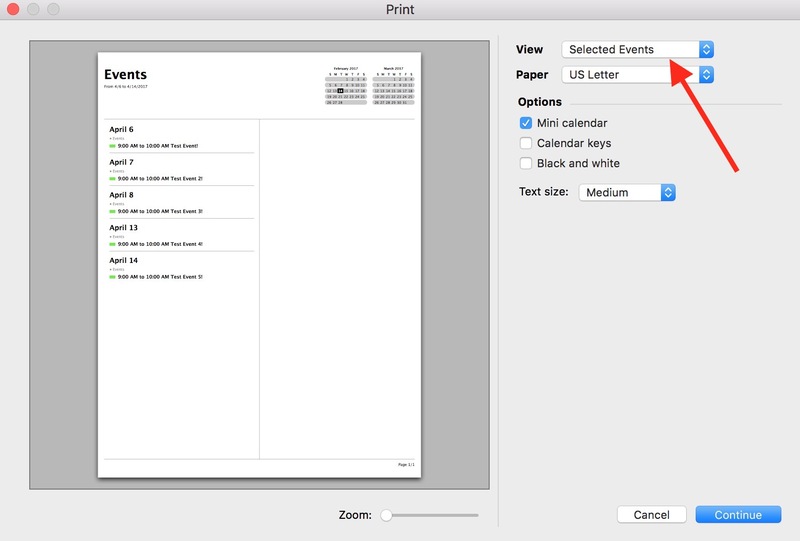 First, open the Calendar program on your Mac, and then find the events you’d like to print. I think this is easiest to do within month view, so select that tab from the top of Calendar’s window or press Command-3 to jump there. See those events? I’m going to select them all to print. To do so, I’ll hold down Command on my keyboard and click each one in turn. Within that window, you can turn off the little mini calendars that’ll appear on your printout or the color-coded key of which calendars your events are on, and you can also switch to black and white or change the text size. 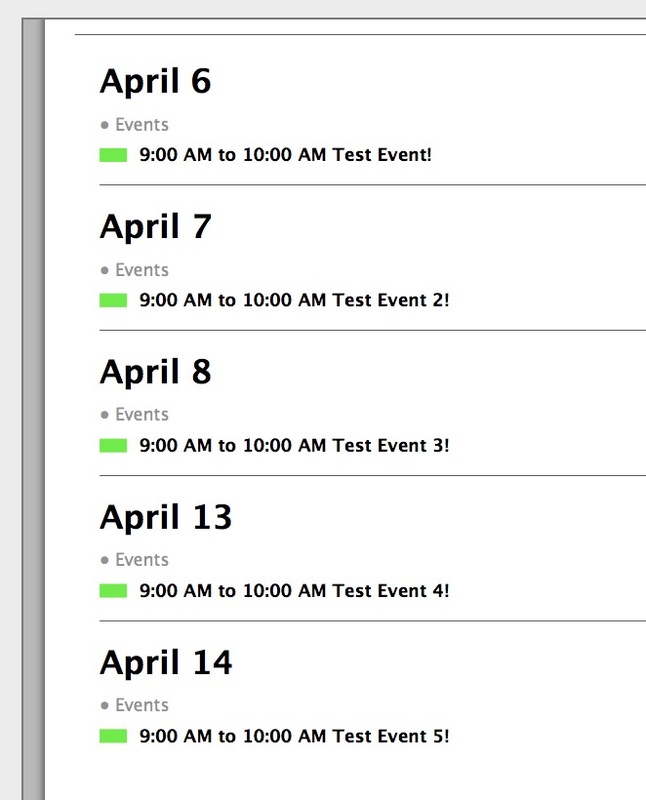 But after you’ve picked your options, the preview window on the left will show you how your printed events will appear. Use the little “Zoom” slider on the bottom to get up close and personal with your potential printout. When you’re satisfied with your changes, click the “Continue” button on that window, and you’ll be taken to the more familiar print dialog to actually send the job to your printer. 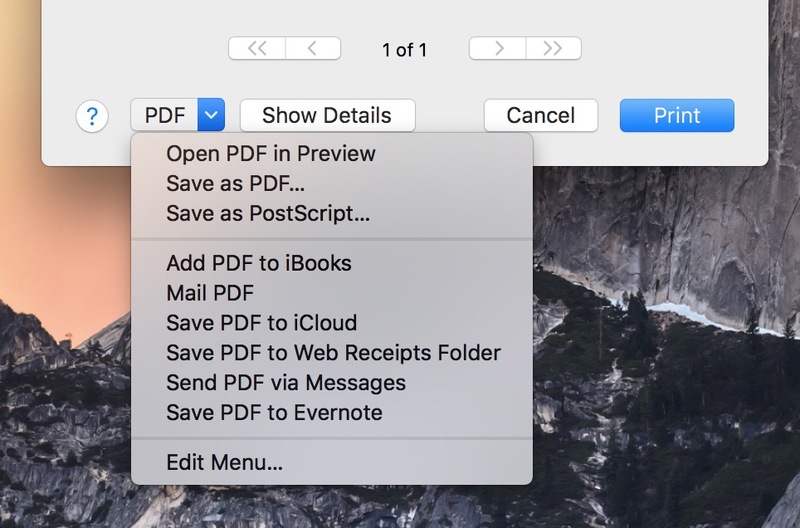 And of course, you could also choose to save out or mail a PDF from that print dialog box, too, in case what you need is to send this printout you’re creating electronically. Neat, huh? Well, considering how much I hate printers and troubleshooting them and, well, pretty much everything to do with them really, the fact that I wrote this tip without gagging is admirable! And I called something having to do with a printer “neat”! I don’t know who I am anymore. Another related question: Is there a way to show the day of the week along with the date for the selected events? Thanks for your write-up — great idea, and still works in latest OS. Now, how can the extraneous/empty url-fields be deleted from printing on many (but not all?) events? Well, that’s frustrating, isn’t it? I’m sorry. Apple didn’t do a great job with the UI there! I have over 2 dozen events over the year that I have to separately & command-click without knowing if I got them as they are constantly highlighted with no indication that they have been selected. after printing, I have to go back to each event on the calendar to check that i did indeed get them all printed. Are you searching with key words. Then printing selected event as a list? It’s still working for me…I just tried it. I’m running 9.0, as well. Huh.